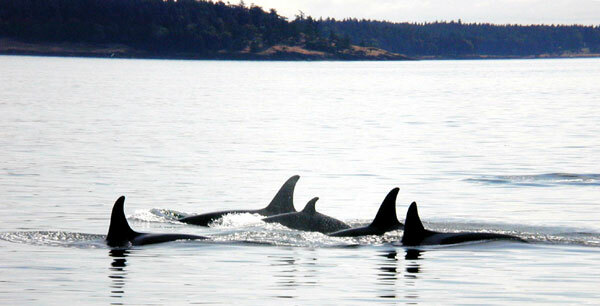 Protection of the resident San Juan orcas as an endangered species by both the United States and Canadian Governments in late 2005 was encouraging. Discouraging news in 2001 was observed by the researchers who study the J, K, and L pods (the 'southern community'). The outlook for the resident killer whale populations of the San Juan Islands (J, K, and L pods) looked very promising up until 1996 (starting from a low of 71 individuals in 1977). Their numbers were increasing each year about 2-3% to a high of 97 in 1996. But, starting in 1995 this recovery took a dip, dropping to ony 82 total individuals in December 2008. 2009/2010 census data showed six new calves and no deaths so the population went up to 88. The 'northern community' population numbers have remained level since 1995 but the 'southern community' has decreased by 15%. There were no adult males in K pod, only one in J pod, and four in L pod during the 2001 season. The Center for Whale Research conducts a daily census every year (when the residents return in June to the San Juan Islands)and has extensive records back until 1976 - each individual whale recorded with photo-identification of both sides of the dorsal fin and saddle. This decrease in numbers may be due to several factors, or a combination of one or all of them - decreased environmental quality, pollution, low population levels, and human interference. Decreased environmental quality may come from several factors, mostly affecting the main food source of the resident populations - salmon. The numbers of salmon have decreased due to overfishing by humans, loss of habitat, and habitat degradation. Humans are in direct competition with the killer whale for salmon. Salmon fishing boats have increased as more people enjoy the fine taste of this delicious fish. Although much of the salmon consumed by man is farm raised, there are still considerable amounts that are wild caught. As the human population increases in the British Columbia/ Washington area many of the original streams and rivers, used by salmon, have been diverted, filled in, or now have dams across them that prevent the salmon from reaching their spawning grounds. Although new laws have reduced habitat loss and created "fish ladders" to help the salmon reach their spawning grounds, their original habitat is not as plentiful as it once was. Habitat degradation is also caused by the dumping of materials (silt from grading as well as chemicals and sewage) into the freshwater streams and rivers as well as the ocean. New laws are helping with reducing this as well as with cleaning up some of the past dumping sites but there is still a long way to go before the waters are pristine. Pollution is always a problem when man enters the natural scene. There is one pollutant that is causing alarm to the scientific researchers studying the killer whale. This is PCB (polychlorinated biphenyls), a byproduct of our industrial age. When ingested, PCBs are deposited in the fatty tissues of mammals. High levels of PCBs are linked to cancer, depressed immune systems, and reproductive problems. Resident males of the 'southern community' are found to have about 150ppm (parts per million) in their tissues whereas the 'northern community' males have only 40ppm. This may be due to the fact that the 'northern community' lives in areas with lower human populations and thus lower levels of PCB pollution than the 'southern community.' Transient males had an astounding 250ppm in their tissues. This is undoubtedly a result of their feeding higher on the food chain (on mammals) than the 'southern communities.' Those species high on the food chain have the highest levels as they are consuming the PCB levels found in their prey, their prey's prey, and so on down to the bottom of the food chain - concentrating more at each level. Females have lower PCB levels because they mobilize their fat during nursing, passing on their load of PCBs to their offspring. It is after their reproductive years that their PCB levels increase. Scientists worry that the young killer whales are starting life with a high PCB level (from nursing) and then adding to it as they consume animals who have concentrated some PCB. Population levels of species may fluctuate over time but each species has a lower limit from which it will probably not recover and will become extinct over time. This level depends on many factors - having low reproductive rates (as do killer whales) is a main concern. If population levels go below a certain point there may never be a chance for recovery with low reproductive rates. The fact that only about 50% of the killer whale babies in the resident populations survive and that females only reproduce every 3-10 years, for a rather short period in their lives, makes scientists very speculative as to the future of the killer whale pods of the San Juan Islands. Although it has only been since 1995 that the populations have declined, the numbers are becoming surprisingly small. The lack of understanding about mating is a big concern with the recent decline in the adult male population. Genetic studies have shown that there is no mating within each matrilineal group either now or in the past and that the residents and transients have completely separate lineages, having no exchange of genetic material for 1,000s of years. Further, the northern and southern resident populations also show no exchange of genetic material for thousands of years. All of this creates concern that this may not be just another cycle. The closest concentration of killer whales, to the British Columbia/Washington concentration, is a group in Alaskan waters. In the area of Prince William Sound, Alaska, there are both resident and transient killer whales. Here, as in the San Juan Islands, the transients and residents are distinct groups, eating different prey and not interbreeding for thousands of years. 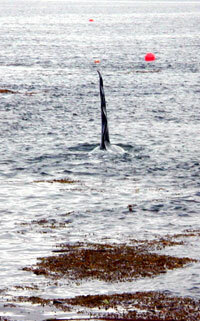 In the pod called AT1, a transient group, the well studied pod of about 22 whales dropped to only 9 in 2003. This area was where there was a large oil spill before the drop in the population - a possible reason for increased pollution and reduced food supply (seals are highly affected by oil spills) in the area. Human interference may also contribute to the future of the killer whales of the San Juan Islands. In the 1960s and 70s many killer whales were taken from the San Juan area - there were no population studies of the killer whales to know what the numbers were prior to this time. It has only been since this original "taking" (in the 1960s and 70s) that the feeding, reproductive, and social structure of the San Juan resident killer whales has been so detailed by The Center for Whale Research. Their long term data bank is a unique set of information for cetacean knowledge. Very few studies have information that has lasted this long and is so detailed. Recently there is a lot of concern about the effects of whale watching on the killer whales. 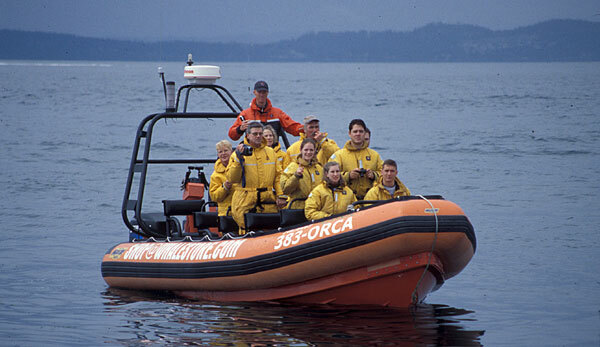 Many people come to the British Columbia/Washington area every year and thousands are taken on whale watch boats to view the resident killer whales every June and July. Sometimes there may be over 50 boats viewing the resident J, K, and L pods. Most people agree that the whale watchers do not directly kill the whales but their presence may influence their behavior. Also, the noise produced by the whale watching vessels (and other boat traffic) may disrupt the whales' ability to communicate with each other. There is also a value in whale watching - to educate the general public so they are informed voters. There may be a trade-off here between the negative impacts of whale watching (disturbing the whales) and the positive impacts (public knowledge). The whale watch companies in both the Canadian and USA side of the San Juan Islands are communicating with each other and The Center for Whale Research to draft their own guidelines for the benefit of all concerned. Many questions remain as to the future of the killer whales of the San Juan Islands. Are there sufficient numbers left to maintain the genetic diversity necessary for a healthy population? Will their low reproductive rate allow their population numbers to increase? Are environmental degradation, pollution, and human interference synergistic … one aspect not directly negatively influencing them but the combination of them all being something that might eventually cause their population to decline?